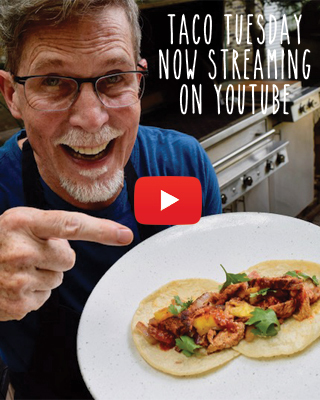 This month’s Xoco menu was inspired by Chef Julio’s childhood memories of his mother’s kitchen in Mexico. 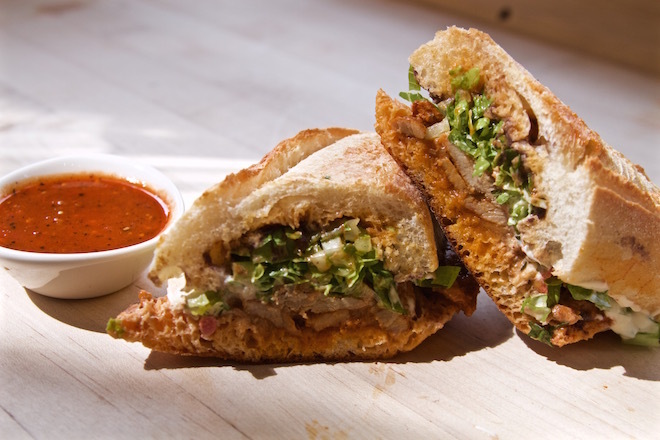 The Red Chile Pork Loin torta is inspired by the meal Julio’s mother would prepare on Sundays, a feast of red chile-marinated pork loin accompanied by fresh molcajete salsa and slow cooked black beans. The intense kitchen aromas of chiles and tomatoes roasting on the comal would serve as young Julio’s alarm clock on Sunday mornings! After school, his mother would serve this Guxamole Caldo to her hungry children when they arrived home. 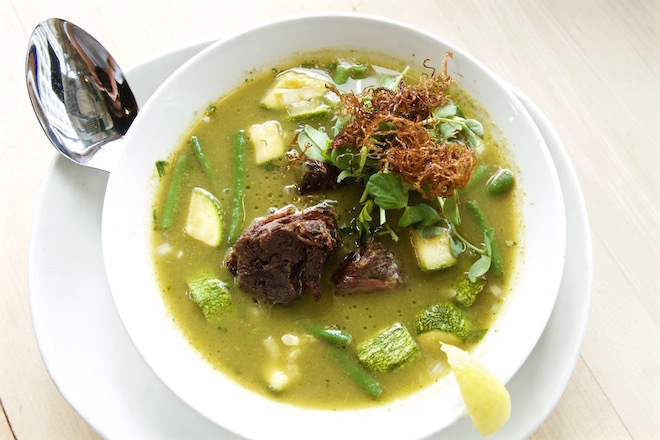 It’s made with braised shortribs served in warm beef stock enriched with roasted tomatillo, serrano chiles, guaje seeds and fresh cilantro. Julio says it’s the ultimate comfort food for rainy spring afternoons. 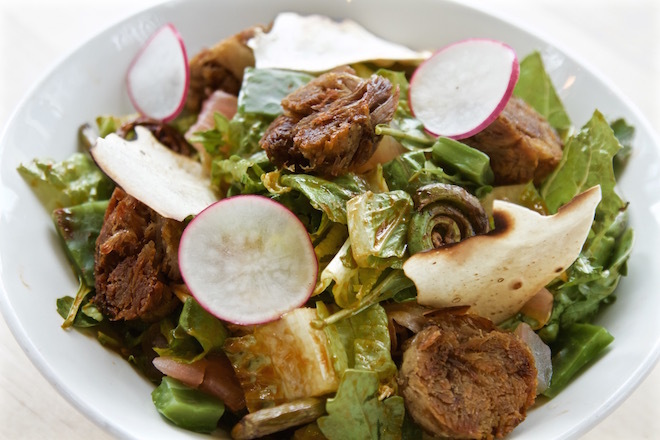 The Crispy Carnitas Salad was inspired by the typical Saturday afternoon meal of carnitas with all the fixings — crispy carnitas, grilled fiddlehead ferns, radishes, fresh nopales, xoconostle and frisée topped with a spicy salsa negra dressing and crispy tortilla. 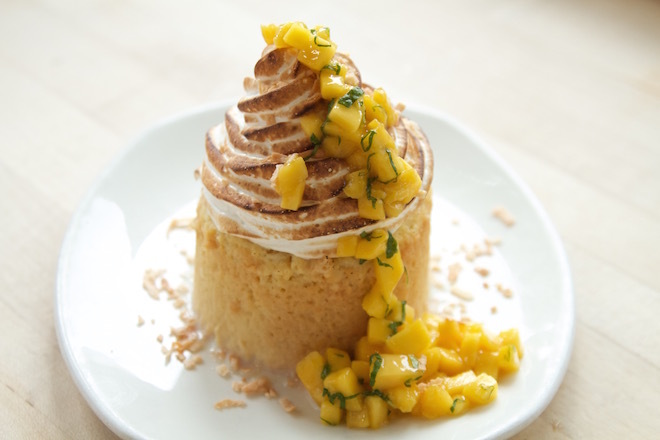 And Chef Wendy’s Coconut 4 Leches Cake is an absolute stunner with torched meringue, and mango-mint salsa. We invite you back to Xoco to make some memories of your own! Love your food I’m a student and I would like to know more.